At one time or another everyone’s walked through a graveyard. Most people, though, might not pay much attention to what’s written on the gravestones and memorials. For those with an abiding interest in family history, they can reveal a wealth of information. Especially in the time before the introduction of the death certificate in 1837, a gravestone can fill out the information about a person in a way no simple parish record can. There tends to be a difference between gravestones and memorials. Both are meant to last and commemorate the deceased, but a memorial is generally of finer stone, such as marble. These will last longer even when exposed to the elements for many years, and a number of memorials for wealthier people will be inside churches. The lettering on gravestones, on the other hand, will become much harder to decipher with time. Although many from the 1700s can still be made out, few that are older are legible. Additionally, many older gravestones have been moved or broken over the years. The fact that parish records show that a body’s in the churchyard doesn’t mean you’ll find the gravestone there or be able to read what’s on it. There’s also the task of searching for the headstone within the graveyard. More modern graveyards are neatly divided into plots so all you need is the plot number and a map. 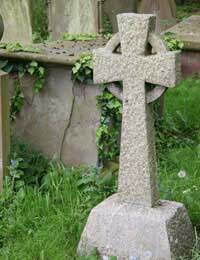 For older graves no such directions exist, so it becomes a matter of trial and error – the same problem won’t exist with the larger memorials, of course, as there will be church records on those. Again, not finding the stone doesn’t mean it’s not there. It just might have become too weathered, with the lettering worn away. If you are lucky enough to find the headstone you need, it can prove extremely helpful in adding to the family history. Most will give the birth and death dates of the deceased (on older gravestones this might well be in Roman numerals), which might not be in the parish records. In many instance you’ll also have the name of the spouse and any children. Although this can often be obtained from parish records on baptism and marriage it acts as a confirmation, and there might be times when the baptism or marriage took place elsewhere. You can be certain that the familial relationships listed on a gravestone will be correct. From that you’ll be able to refine what you know about two generations. If you’re lucky enough to find the headstones of the offspring you can extend that. In some exceptional circumstances there might be information on how the person died, too. Where the spouse is buried in the same or an adjoining grave there will also be information on that person, and that helps fill out the story. It wasn’t uncommon for a couple to share a single gravestone – cost was often a factor. Not all the dead will have headstones. The poor wouldn’t have been able to afford such things, which puts family historians at a disadvantage. You should never bank on being able to find a gravestone. There can be so many factors working against you in your search. Consider it a huge plus to locate a legible one. In 1837 civil records were introduced for births, marriages and deaths. There was plenty of information about the deceased on the death certificate, more than could fit on any gravestone. That said, an image of the stone in a family history does add depth. For those who were cremated, after the general introduction of cremation, there tended not to be headstones, but small plaques. These tend to give little or nothing to a researcher. The real value of gravestones is for deaths prior to 1837. Where they can be located they can prove invaluable for filling out family information. For what they can offer it’s definitely worth taking the time to try and find them, and half a day spent searching through a graveyard is never wasted time to anyone interested in the past.